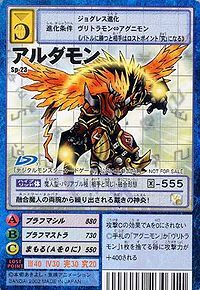 A Digimon that possesses power over Flame that has transcended legend by inheriting all the might of one of the legendary Ten Warriors and acquiring unknown abilities. Although it makes many enemies with its rough behavior, its name is derived from the fused form of a god of Indian mythology, and since it possesses both the wildness of a beast and the intelligence of a human, it is a Demon God that fights by converting anger or fear into righteous strength. In battle, it unleashes super-wide ranged attacks that melt everything then burn it up without a trace. This aspect has enough destructive power, in that moment, to bear a close resemblance to the menace of modern nuclear weapons. Its Special Moves are enhancing the holy flames of its "Digicore" to their utmost limit, then personally manufacturing the high temperature and high density core of the sun, before detonating it (Brahmashira), and the high-speed rapid-firing of the extremely high-temperature shots it unleashes from the "Rudriya Darpaṇa" superweapons on both of its arms (Brahmastra). [N 1] Also, it is capable of fighting using the Rudriya Darpaṇa in hand-to-hand combat, and it specializes in close combat. 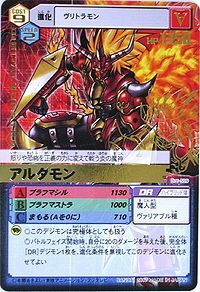 Title: 「火の融合闘士」 — "Fused Warrior of Fire"
From Alder, which is short for Aldernalisuvara 「アルダナーリーシュヴァラ Arudanārīshuvara」, a name variation of Ardhanārīśvara (अर्धनारीश्वर) particularly used in Japan. Ardhanārīśvara is an aspect of Shiva representing the balance between masculinity and femininity, depicted as an androgynous figure split down the middle. This can relate to Aldamon, as it is composed of a balance between human and beast. 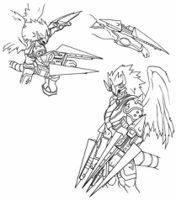 Anime/Manga Digimon Frontier: "Takuya's Fusion Evolution, Aldamon's Explosive Attack!" 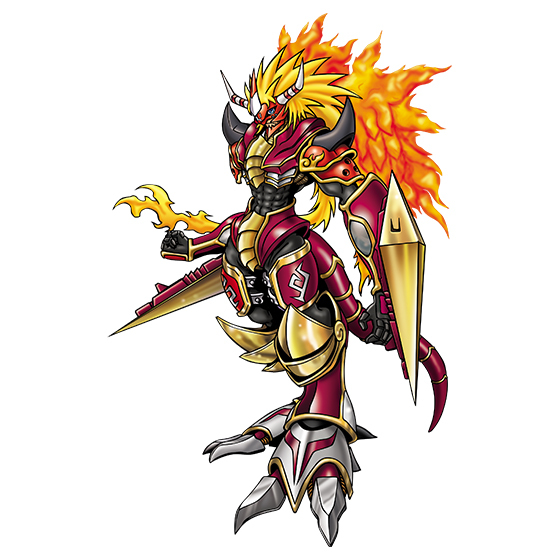 ブラフマストラ Burahumasutora Atomic Inferno/Plasma Inferno Fires extremely high-temperature shots from the weapons on its arms. 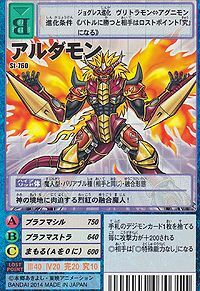 ブラフマシル Burahumashiru Solar Wind Destroyer/Plasma Destroyer Uses the holy flames of its Digicore to create a huge ball of fire like the core of a sun and throws it. With aid from the power of Seraphimon's DigiTama Kanbara Takuya was able to combine the powers of the Human Spirit of Fire and the Beast Spirit of Fire to become Aldamon. 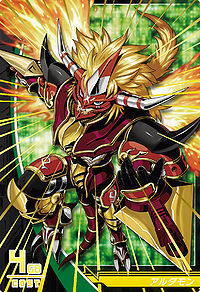 Kanbara Takuya Spirit Evolves into Aldamon to combat the Venom Vamdemon and Belial Vamdemon created by Quartzmon. When his power alone was not great enough, the other chosen joined in to become Susanoomon. 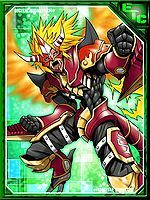 Aldamon is only obtainable as a collectible card. 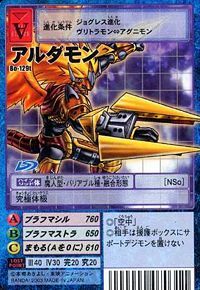 Its card is part of the Agnimon Evolution (アグニモン進化 Agunimon Shinka) set. 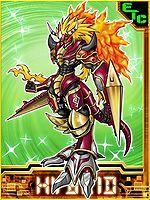 Aldamon is available as a Digimon Medal. Aldamon can be obtained by scanning the barcode "0000000070311". A crimson fused demon man who challenges the horizons of God! 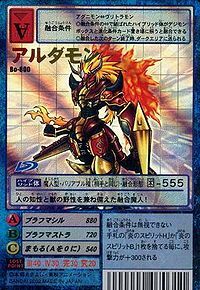 This fused demon-man performs its flaming battle spirit dance on the battlefield! This fused demon man combined the intelligence of man with the wildness of beasts! 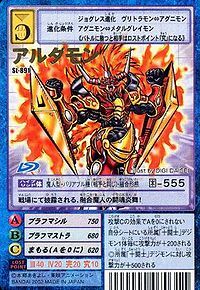 This fused demon man fires divine flames of judgement from its Rudri Tarpana! A demon god of fire, who fights by turning anger and fear into the power of justice. 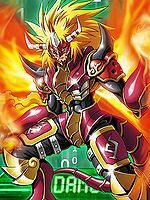 Having inherited the powers of the Warrior Ten of Fire, it gained yet-unknown abilities and surpassed legend by fusing the powers of human and beast. It fights by changing the emotions of fear and anger into the power of justice. 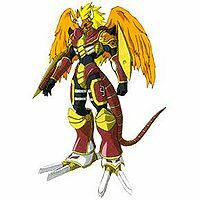 ↑ Digimon Frontier: "Takuya's Fusion Evolution, Aldamon's Explosive Attack!" ↑ The Rudriya Darpaṇa (रुद्रियदर्पण "rudriya darpaNa"?, lit. "Terrifying Mirror") is a superweapon detailed in the 1923 Sanskrit text, the Vaimānika Shāstra. Internet Sacred Text Archive, retrieved 06/14/12; The Vymaanika-Shaastra, Ch. III: "Rowdree-darpana is a mirror or lens which liquefies everything that it flashes against. Paraankusha says that where Rudraanyosharaa and abhralinga come into contact, a fierce force called roudree comes into being. Mingling with solar rays it melts everything. 'Sammohana kriyaa kaanda' says: 'By the mixing of roudree and solar rays an evil force called maarikaa is generated, and impelled by the solar electricity, it destroys the enemy planes.'"